The US Navy says it's removed Seventh Fleet Commander Vice Admiral Joseph Aucoin after a series of collisions involving its warships in Asia, as the search goes on for 10 sailors missing since the latest mishap. WASHINGTON/TOKYO (REUTERS) - The US Navy on Wednesday (Aug 23) said it had removed Seventh Fleet Commander Vice-Admiral Joseph Aucoin after a series of collisions involving its warships in Asia as the search goes on for sailors missing since the latest mishap. 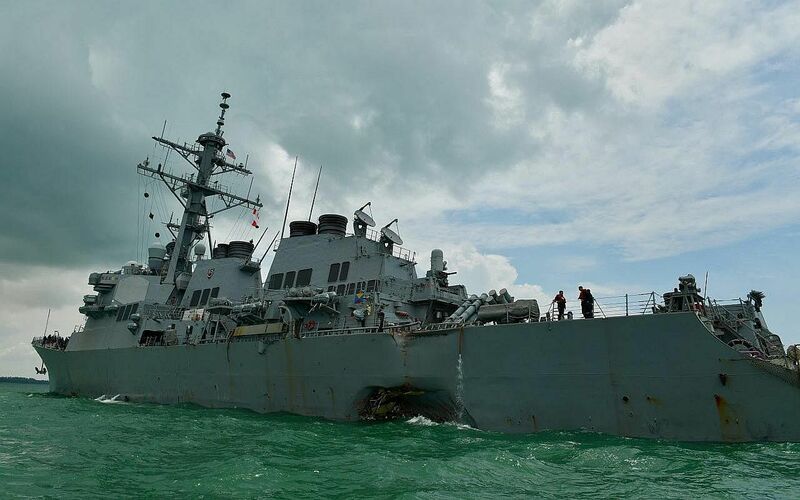 Vice-Adm Aucoin's removal comes days after a pre-dawn collision between a guided-missile destroyer and a merchant vessel east of Singapore and Malaysia on Monday (Aug 21), the fourth major incident in the US Pacific Fleet this year. "Admiral Scott Swift, commander of US Pacific Fleet, today relieved the commander of Seventh Fleet, Vice-Admiral Joseph Aucoin, due to a loss of confidence in his ability to command," the US Navy said in a press release. Adm Swift, who travelled to Japan to relieve Vice-Adm Aucoin, ordered his deputy Pacific Fleet commander, Rear-Admiral Phil Sawyer, to immediately take command of the powerful US force. Vice-Adm Aucoin was due to step down next month, with Rear-Adm Sawyer, deputy commander of the Pacific Fleet and a submariner by trade, already slated to succeed him. Vice-Adm Aucoin came up through the Navy's air wing as an F-14 navigator. The Seventh Fleet, headquartered in Japan, operates as many as 70 ships, including the US Navy's only forward-deployed aircraft carrier, and has around 140 aircraft and 20,000 sailors. It operates over an area of 124 million sq km from bases in Japan, South Korea and Singapore. The accident involving the USS John S. McCain and the tanker Alnic MC in the Singapore Strait came at a tense time for the US Navy in Asia. This month, the John S. McCain sailed within 12 nautical miles of an artificial island built by China in the disputed South China Sea, the latest "freedom of navigation" operation to counter what the US sees as China's efforts to control the contested waters. An official Chinese newspaper said on Tuesday the US Navy's latest collision shows it is becoming an increasing risk to shipping in Asia despite its claims of helping to protect freedom of navigation. Also this month, North Korea threatened to fire ballistic missiles towards the US Pacific territory of Guam in a standoff over its nuclear and missile programmes. "Losing another ship now is bad timing. It may raise concern over America's defensive capabilities and it could send the wrong signal to North Korea and China," a senior Japanese Maritime Self Defence Force officer said, asking not to be identified because he is not authorised to talk to the media. An international search-and-rescue operation involving aircraft, divers and vessels from the US, Singapore, Malaysia, Indonesia, and Australia was looking for 10 US sailors missing after Monday's collision. On Tuesday, US Navy and Marine Divers found human remains inside sealed sections of the damaged hull of the USS John S McCain, which is moored at Singapore's Changi Naval Base. The Navy has not yet announced the identities of the bodies discovered. The US Navy is also working to identify a body found by the Malaysian navy about eight nautical miles northwest of the collision site. Photos posted on the Twitter account of a Malaysian navy frigate on Wednesday showed crew carrying what appeared to be a body to a US Navy helicopter. The latest collision has already prompted a fleet-wide investigation and plans for temporary halts in US Navy operations. The John S. McCain's sister ship, the USS Fitzgerald, almost sank off the coast of Japan after colliding with a Philippine container ship on June 17. The bodies of seven US sailors were found in a flooded berthing area after that collision.